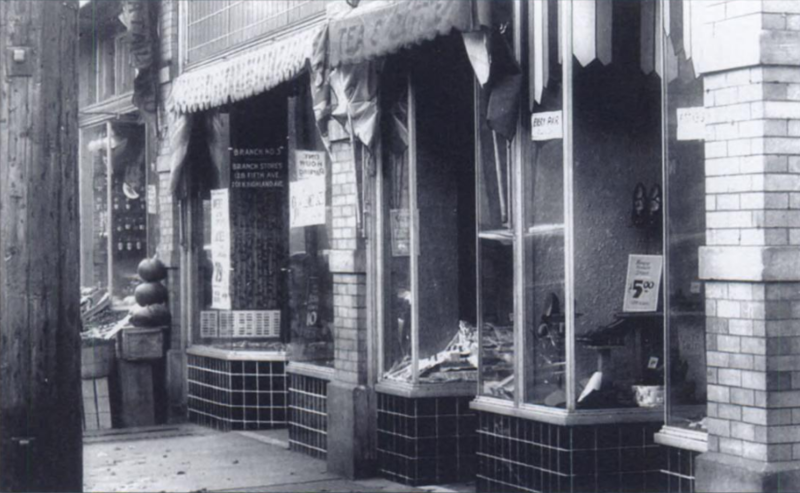 Once upon a time, Homestead was well-known for its business district on Eighth Avenue, and Jewish shopkeepers were disproportionately represented amongst the merchants on the avenue. There were Jewish merchants in town from almost the beginning. The first to become well-known locally were Abraham Skirball, the first Jewish resident of Homestead, who moved to town in 1881 and opened a saloon and later a shoe store, and Ralph Segelman, the first president of the shul, who opened a jewelry store in 1884. By the turn of the century there were many more Jewish merchants opening stores in town, amongst whom the best known were Isadore and Ignatz Grossman (1890 & 1897), the Grinberg Bros. (1893), Joseph Lasdusky (1893), Morris Frankel (1895), Goldston & Mervis (1897), Philip Cohn (1897), the Half Bros. (1899), and Benjamin Friedlander (1899). The earliest of these merchants bet on Homestead before it was a sure thing. Their gamble was rewarded by a strike in 1892 and a country-wide depression through the end of 1897, which led to unemployment and a population dip in Homestead. But during the summer of 1897, for the first time in years the mill began running in full. The steel company soon announced plans to expand and kept on making additions into the early 1900s. Simultaneously, “four gigantic works,” including the Mesta Machine Company, began construction in late 1899. These were far from the only new businesses in town. As an advertisement in the paper proclaimed, “An army of 5,000 workmen means a population of at least 15,000 people….The grocer, the butcher, the baker, and a host of other trades people must be there to supply them with what they need.” 1 As was typical in the small towns of Steel Valley, many of the new tradespeople in Homestead were Jewish, and those who came to came to clothe the workers were overwhelmingly Jewish. This post tells the story of one of these new merchants through his advertisements. 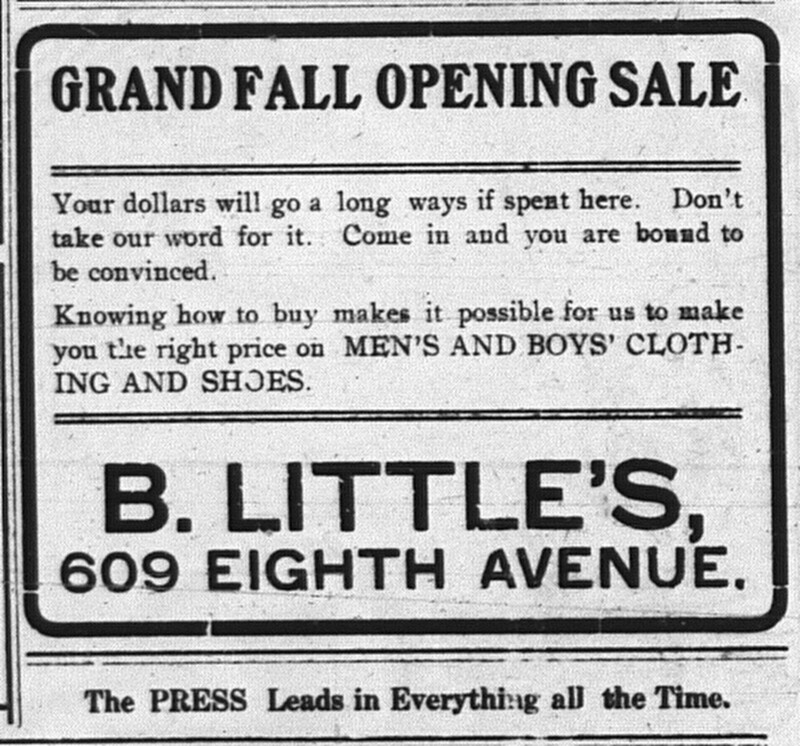 A 11/8/1906 advertisement for B. Little’s clothing and shoe store in the Homestead Press. Alas, the Press did not “[lead] in everything all the time: the paper was short-lived, and very little of it survives. I suspect there were more and earlier advertisements for B. Little’s in this paper that are now lost, making it that much harder to pinpoint the store’s actual founding date. Ben joined the town’s businessman’s association in February 1907 and was thereafter mentioned regularly in connection with its activities, as was his brother H.L. Along with all the town’s leading merchants, Jewish and non-Jewish, they contributed floats and costume contest prizes to the annual Hallowe’en parade, which drew visitors from all over the Mon Valley (and from 1908 and 1909 was headlined by the KKK!). They served on committees for its annual picnic and supported its causes, like the summertime “early closing movement” and eradicating trading stamps. The Jewish merchants were especially involved with the monthly “Home Trading Day” events, inaugurated in 1911 by then-synagogue president Joseph Lasdusky, to dissuade Homesteaders from shopping in Pittsburgh. All the merchants were prominent men in Homestead. They were expected to contribute to charity, and lists of contributors were printed in the paper for all to see. Many merchants, like H.L., were mentioned in the paper in a personal context — H.L.’s 1911 wedding received a lot of coverage, as did his and his wife’s subsequent trips and illnesses — and some appeared in connection with the town’s fraternal groups, as when B. Little helped to organize the town’s new Owls chapter in 1912. Because the Avenue was so important to Homestead’s self-images, its merchants were expected to have attractive display windows decorated appropriately for holidays and patriotic occasions, and their efforts were reviewed by the paper. Business moves and improvements were reported with breathless excitement. 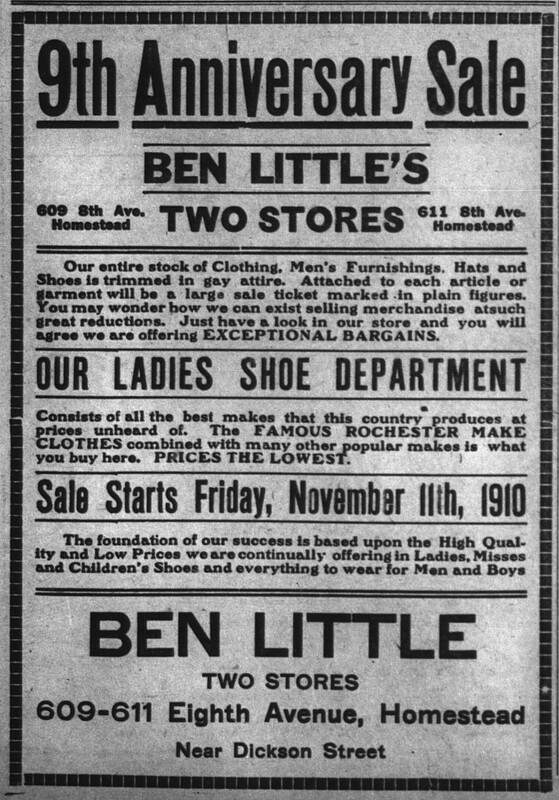 This advertisement from 11/10/1910 suggests Ben’s store opened in 1901… which seems unlikely to me. It wouldn’t be the first time this kind of anniversary ad padded the math. Anyway, it is always difficult to recover the exact founding year for this kind of store, because they often began as small shops in poor neighborhoods. They opened with little fanfare, the cost of advertising being out of reach, and the enumerators of city and business directories overlooked them. The style of advertising then in vogue gave the merchants a place to tell the town their story in their words. There was a narrative style to these advertisements, individually and especially collectively. Yes, the ads were almost always about sales, deals, or just plain quality service, but the marketing message was often connected to the ongoing progress of the merchant and his store. 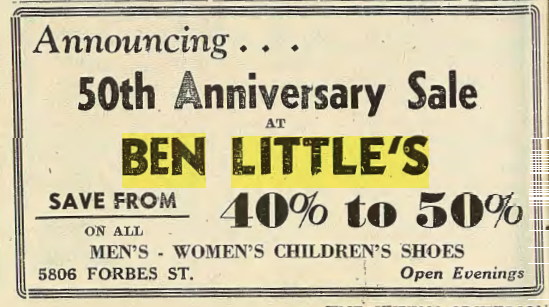 This 1910 advertisement, for example, gives Ben the space to brag about two important milestones in his business — its anniversary and its expansion! Ben Little, the well known merchant on the upper end of Eighth avenue, like his brother, H.L. Little, is branching out. He has leased the store room adjoining his place of business and fitted it out for his gents’ furnishing and clothing and will use his old room for shoes exclusively. He has added a large stock of ladies’ shoes to his stock of men’s and boys’ shoes and will cater to the ladies’ trade in this department in the future. He had also added to his stock of gents’ furnishing and clothing. He has also added to his stock of gents’ furnishings and clothing. He has improved both of the store fronts and now has the most attractive place on the upper avenue. Both stores are open for business today. 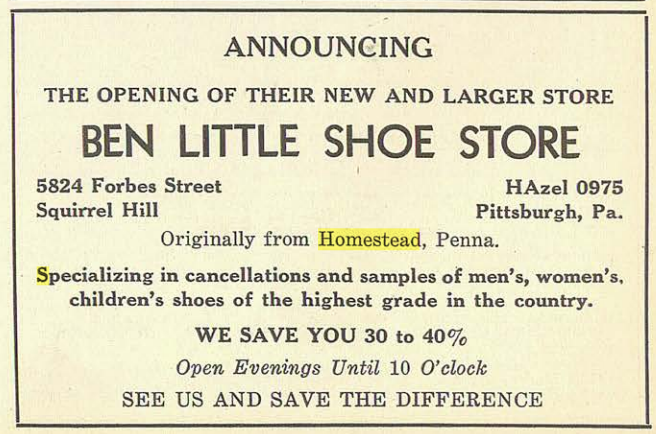 By this point the Little name was synonymous in Homestead with good shoes and successful businesses. 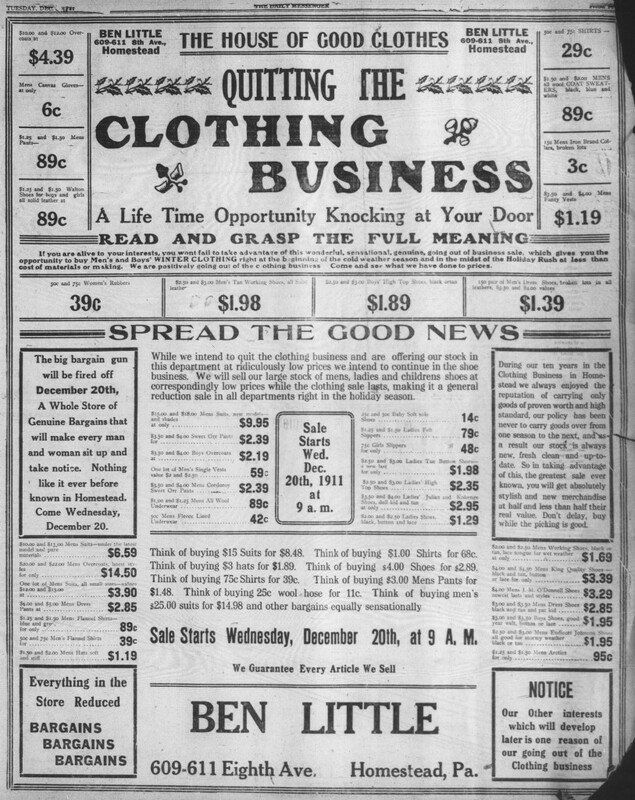 In case townspeople missed the point when they walked past their stores on the Avenue, the brothers helped their cause by filling the newspapers with advertisements touting the virtues of both Ben’s shoe & clothing store and H.L. & Jacob’s shoe store. In return, the paper accorded them respect and promoted them as leading, respected citizens. The trait that tickles me most about the narrative style of these old ads is that a sale was never just a sale. There was always a labored explanation: I’m selling my goods at a reduced price because they were damaged in a fire, because I’m short on cash, because I’m going out of business, because my landlord is kicking me out, because my contractor is behind schedule (my personal favorite), because I bought them cheaply in a bankruptcy sale, because the unseasonable weather does not suit my season-specific goods, or — as the above advertisement explains — because I’m changing business strategies. Often the ads presented the sale as a chance to assist the merchant: you help me by taking all this stuff off my hands, and I’ll help you by often the best deals you’ve ever seen. The obvious reason for this sale was that Ben was switching businesses, but both the ad and the paper recognize that a major sale before Christmas was not standard practice. Ben Little, who has for a number of years been in business at 609-611 Eighth avenue, announces that he is going to quit the clothing business and hereafter devote all his time to his other lines and with this end in view he announces a big sale for this week, which is something out of the usual for the week before Christmas. 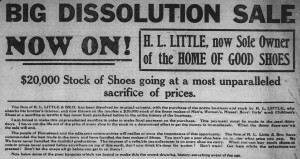 He announces that he will sell hos (sic) clothing at one-half off and will also offer his other lines at greatly reduced prices during the sale, which starts today and lasts the week out. This is an unusual chance to get Christmas gifts cheap. Ben began remodeling the building by 3/26, moved into the building 4/4, and opening the evening of 4/6. The formal opening came the following week. 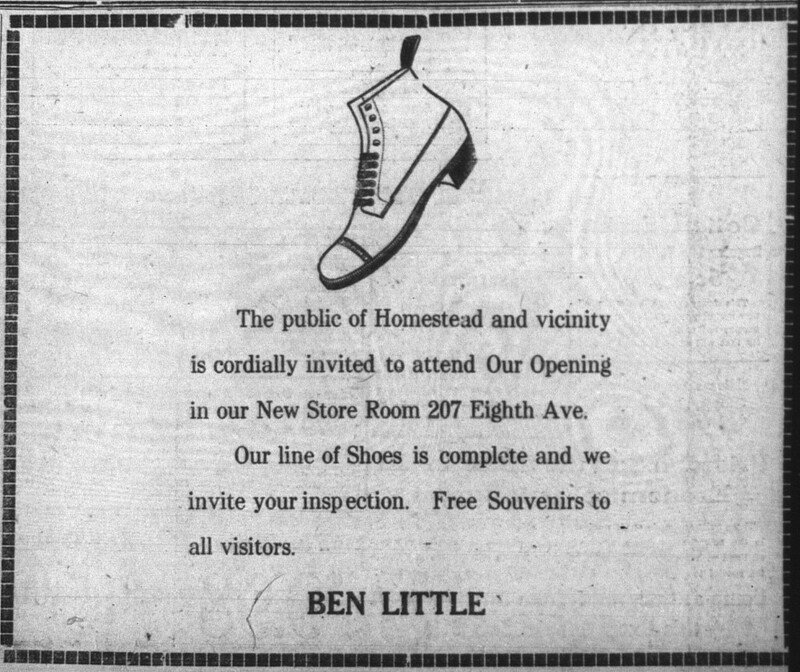 4/11/1912: Invitation to the opening of B. Little’s new shoe store. This is another typical style of advertisement for major store events. Ben Little has completed arrangements for the opening of his new shoe store at 207 East Eighth avenue, tomorrow and Saturday. He has [one of the best] locations on the avenue, it being near the corner of Amity street, and the store has been handsomely remodelled (sic) and is well suited for the purpose. Mr. Little has been in business here for ten years but he [now] has the largest and most complete stock he has ever carried. The display windows are nicely decorated for the opening. During this period many merchants on the Avenue underwent similar business shifts, relocations, and expansions, which were reported in similar fashion. So far, these ads and accompanying articles are typical. What is not typical is the front-page publication of this photograph! 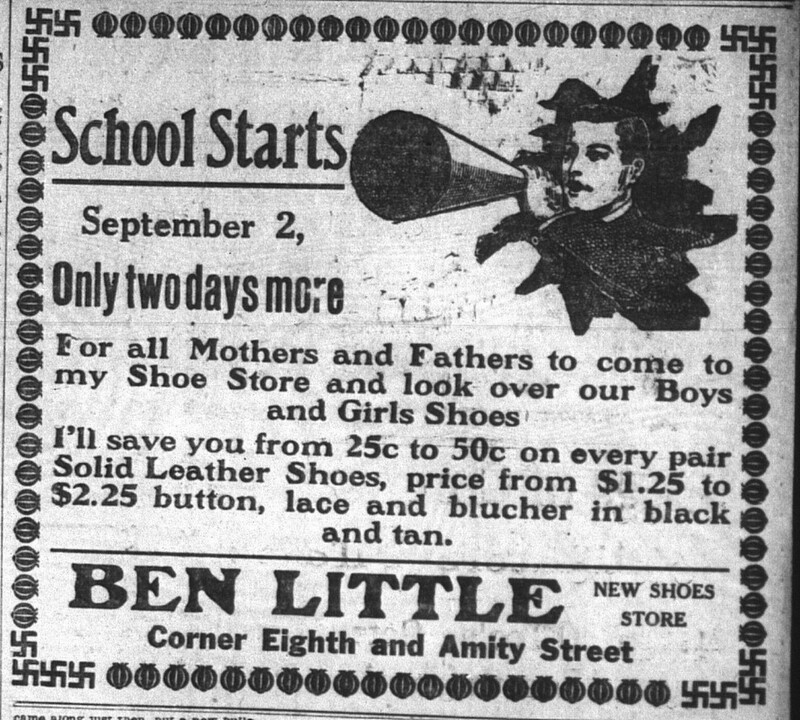 7/17/1912: “This is the popular shoe store of Ben Little at 207 Eighth avenue.” The timing of this photograph coincided with “his first shoe sale in his new stand,” which kicked off with a full-page ad on 7/17 and ran ten days. It was extremely rare in this period to see photographs in the paper of any Homesteaders other than politicians. Here, on the front page of the paper, is a twenty-nine year old naturalized citizen proudly displaying a storefront he know stands up to any in town. That summer also brought changes in the other Little shoe store. On June 6 H.L. put a long notice in the paper, accompanied by his own headshot (! ), which began, “I desire to inform my friends and customers that I am now the sole owner of ‘The Home of Good Shoes’ at 319 and 321 Eighth avenue. 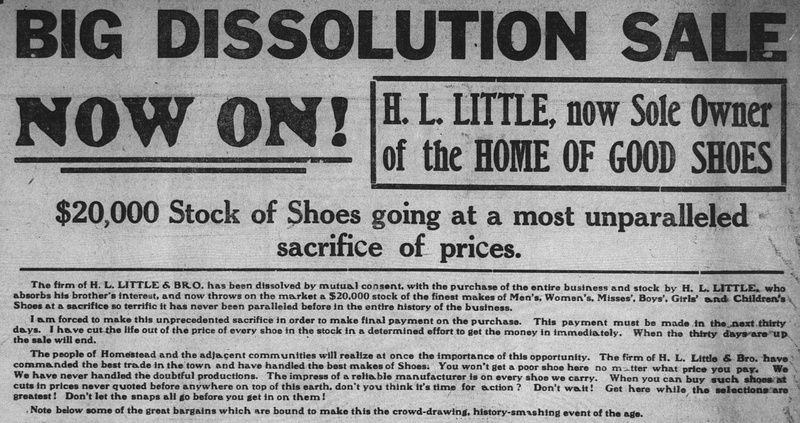 I have purchased the interest of my brother, and have just started a big sacrifice or dissolution sale in order to get the money necessary to make the final payment on this purchase.” Of course, a full page ad announcing the sale followed (at right). After being bought out, what did brother Jacob do? Why, he opened his family’s third shoe store in Homestead in a building right between his brothers’ stores! He called it the Victor Shoe Co., since a third Little store would create an even bigger confusion than there already was. Ben Little the shoe merchant is keeping abreast of the times. This week he had the petition removed from the rear of his store and has thrown the entire building into one big room. This will given him a third more floor and shelving to allow to add to his already large stock of Men’s, ladies, misses and childrens shoes. 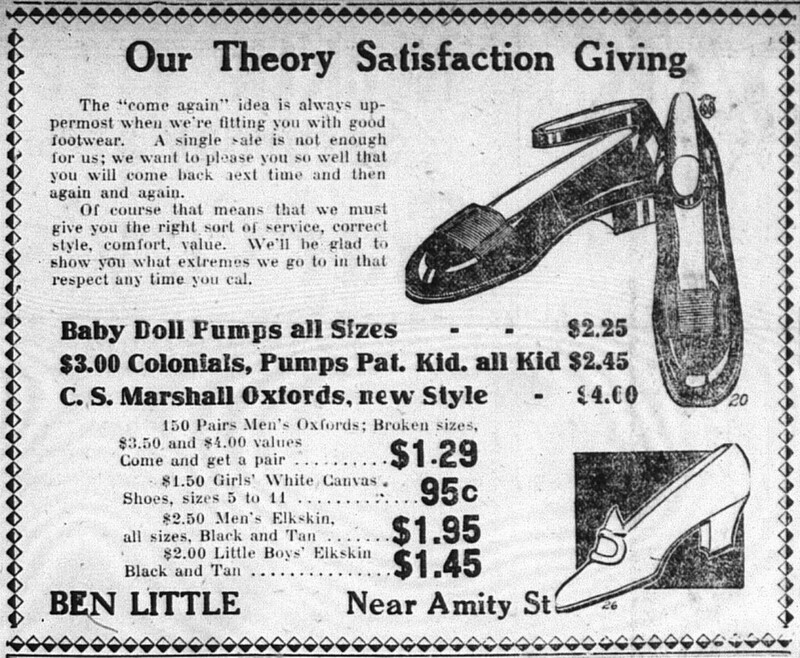 It is only a little over a year since Mr. Little moved into his present quarters and started in the shoe business exclusively and he has met with great success, he being acknowledged as one of the leaders in his life in the town and his ever increasing business made the enlargement of his room necessary. Not only does the addition give him more room but it makes the store much more attractive on account of the big windows in the rear. He is holding his fall opening today and invites every lady to call in and look over his stock. 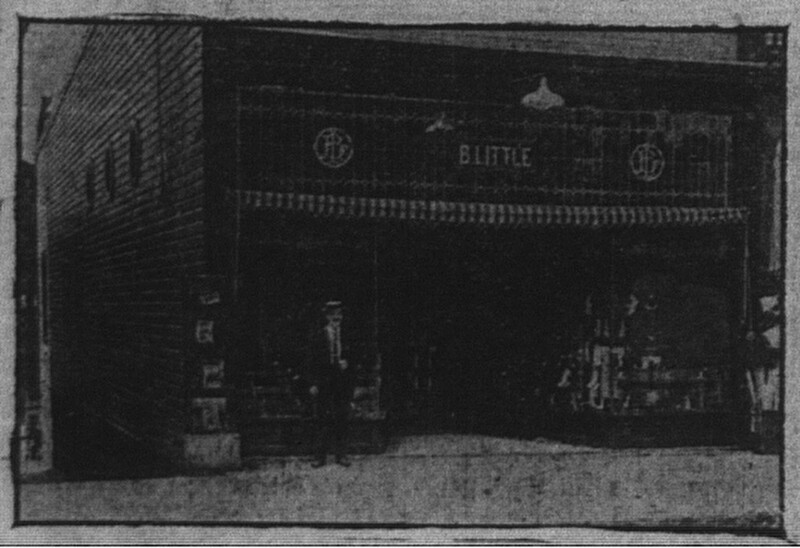 8/30/1912: Just a typical ad for B. Little’s store — except for that border! In September 1909 the Homestead paper got a new set of type, including fun new border elements for advertising. Suddenly swastikas appeared everywhere in the paper. They were all the rage through 1912, though they still appeared intermittently after that. Of course in 1912 the hooked cross was nothing but a symbol of good luck, but it’s impossible for us not to startle at the sight. Though the town’s leading merchants were treated as leading citizens, they weren’t all residents of the town. Running a business in Homestead did not require living there, since street car lines linked the town with Pittsburgh. Jacob Little never lived in Homestead; at this time he made his home in the Uptown neighborhood of Pittsburgh. H.L. and Ben did live in Homestead, which may be why their names appear frequently in connection with the town’s business and civic activities and Jacob’s never ’til he opened his own store. Though they lived in Homestead, neither H.L. nor Ben belonged to the shul. I’ve found just a couple hints of Ben’s involvement in Jewish social life in town — he was the warden of Homestead’s B’nai B’rith lodge 1909-10, and he was on the board of directors for the Y.M.H.A. in 1919. 3 However, there was another Little in Homestead who did join the shul. You haven’t met him yet, because he was not a merchant on the avenue. He was the oldest brother, Henry, who immigrated in July 1907, later followed by his wife and five children. His first address in Homestead was the same as Ben’s store. There, he, and probably also his wife and older children, made cigars, a very common occupation for Jewish immigrants. This work was at the very bottom of the economic ladder, which suggests he wasn’t getting much assistance from his successful younger brothers. By 1910 he opened a confectionery store in the ward (a shop that sold candy, tobacco, cigars, ice cream, soda, &c.), then around 1912 he moved out to Homeville, where he had a dairy farm, before going into business in the teeny-tiny town of Eldersville. All this evidence suggests he never quite got his economic footing. He first appears in the synagogue records in 1908, including his first annual purchase of High Holiday tickets. He was not able to afford to join the shul ’til just before the High Holidays in 1916, a common delay likely related to his financial circumstances. He was suspended in the mid-20s for not paying his dues, possibly because of his departure for Eldersville. He got sick there in 1926 and was buried in the Homestead cemetery later that year. Widowed sister Rose and her children immigrated around 1928 (late!) and also settled out in Mifflin Township where her grown sons farmed. They kept this up for 5-6 years before moving to Squirrel Hill. She and one of her sons were also buried in the Homestead Cemetery. Whether they participated in the shul or not I could not say (as it is extremely difficult to trace single women in the synagogue records, since they could not join). Ben’s advertisement from the 1921 Homestead city directory. But his personal listing indicates that he no longer lives in Homestead! Jacob and H.L. Little were early adopters of Squirrel Hill. Jacob was the first to move there sometime after 1914. In October 1919 he was elected to the Board of Trustees of the new Beth Shalom Congregation of Squirrel Hill, but he didn’t complete his term, dying in April 1920. H.L. moved there in the spring of 1919, but he, too, died a few months later. Back in Homestead, H.L.’s store lasted until 1926 or 1927, when it was sold and renamed. Jacob’s oldest son, Hyman, took over operation of the Victor Shoe Co., and that store lasted well into the 70s or 80s. By the late 1920s, the only shoe store on the Avenue to proclaim the Little name was Ben’s. But by this point Ben was no longer a resident of Homestead. He, too, had made the leap to Squirrel Hill, moving in with H.L.’s widow and two young children shortly after H.L. died. The change of scenery did him good. At the age of 39 he took a wife! Mr. J. J. Streng announces the marriage of his daughter, Regina J., to Mr. Ben Little, of this city, on Sunday, July Ninth. After an Eastern trip, Mr. and Mrs. Little will reside at 6443 Forward Avenue, Squirrel Hill. Born to Mr. and Mrs. Ben Little (nee Regina Streng), of Forward Avenue, on Monday, December Thirty-first, at the West Penn Hospital—a daughter, Henrietta Pearl. Mr. and Mrs. Benjamin Little, formerly of Forward Avenue, are now residing on Shady Avenue. At some point he joined Rodef Shalom, where his daughter attended Hebrew school. Despite his new family obligations on the other side of the Mon, Ben kept up his business in Homestead — for a while. 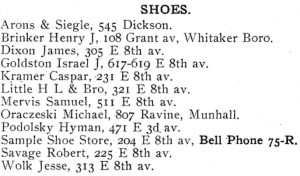 The 1931 Homestead city directory includes his shoe store. 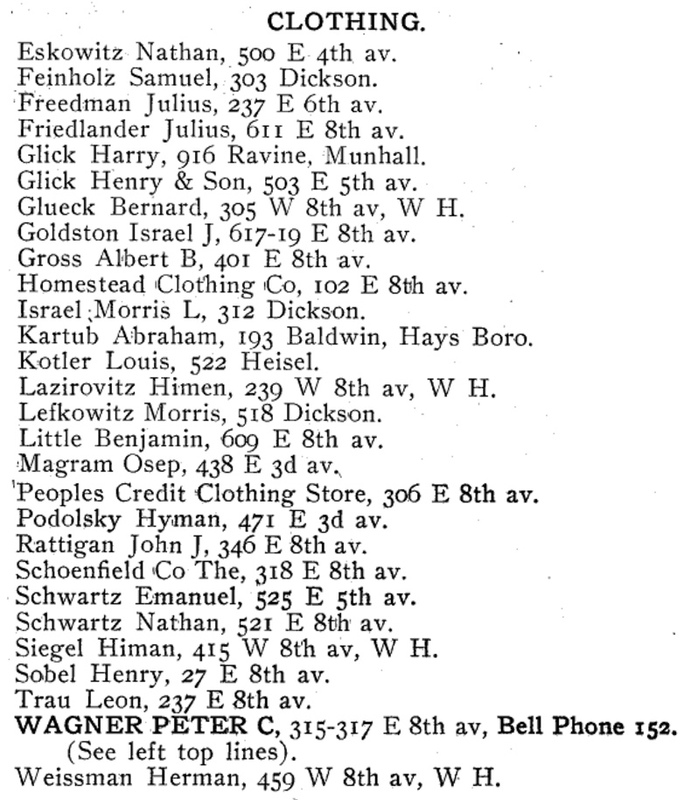 The next directory didn’t appear until 1937 — no shoe store. Where did it go? This 3/31/1933 advertisement from the Jewish Criterion is the earliest record I’ve found for Ben Little’s store in Squirrel Hill. Yup, he moved his store to a prime location in Squirrel Hill! In fact, this photograph was taken not long after it opened! 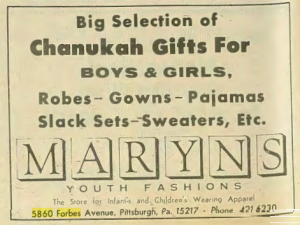 This 12/31/1934 advertisement from the American Jewish Outlook explicitly links Ben Little’s store in Squirrel Hill to its original location in Homestead. Note the “32 years” in the bottom right — that places the founding at 1902. 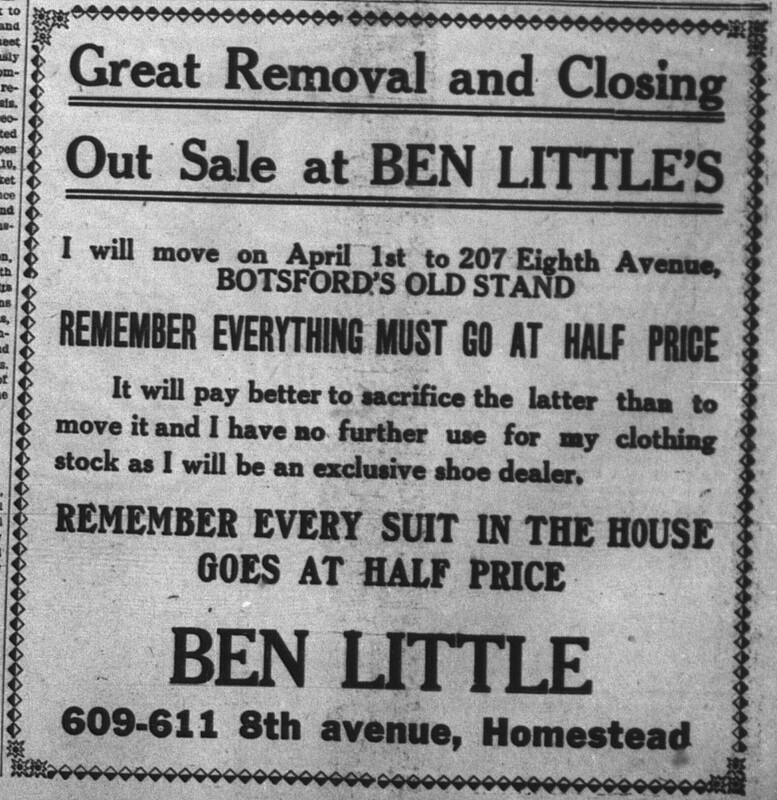 4/7/1939: Ben Little Shoe Store relocates to Forbes. 6/23/1950: More dicey anniversary math in this advertisement — 50 years means a 1900 founding. This address is probably a typo — other ads from this period give the address as 5860 Forbes. He moved to this location by September 1945. If every advertisement is a page out of the merchant’s story, then this present-day marketing is about the loss of history. What happened to the store after 1951 I could not tell you, except that today the Little name is still there in the middle of Forbes Avenue, tempting us all with its display windows (not as fabulous as in the days of Ben’s genius model airplanes, but handsome enough to tempt me). I guess I could just walk down there to ask again, but when I tried that after discovering the first of the early 1900s Little advertisements, I was told the store had no connection to Homestead. Maybe they really have forgotten their roots, as their shopping bag suggests. 3/23/1934: This classified ad from the Pittsburgh Post-Gazette is the earliest reference I’ve found to a Little’s at 5850 Forbes. Correction, 4/22/2016: In my original post I stopped just short of re-assembling this history correctly. Long-time Homestead businessman Stan Levine of the Levine Bros. Hardware Store corrected me that it was Victor’s Shoes that was the precursor of Little’s in Squirrel Hill. (Thank you, Stan!) Of the three shoe-selling Little brothers of Homestead, it turns out that it was not Ben, but the dark horse, Jacob, who prevailed, through the efforts of his son, Hymie. 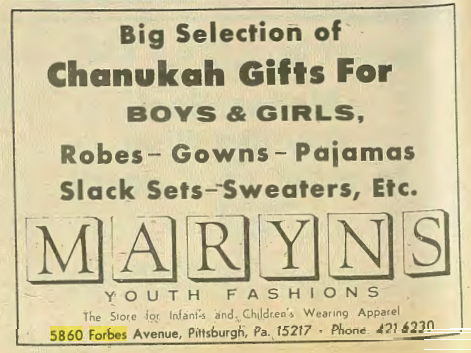 12/2/1966: In the mid-60s, Ben’s old storefront on Forbes became a children’s store called Maryn’s. This name might sound unusual to you, but for me it is the beloved name of one of my nieces, who loves to tease me for being lazy in the mornings. Had I not been so lazy about my research, I would have discovered this delightful coincidence much sooner… and gotten this article right the first time through. Egg on my face aside, my original point stands. 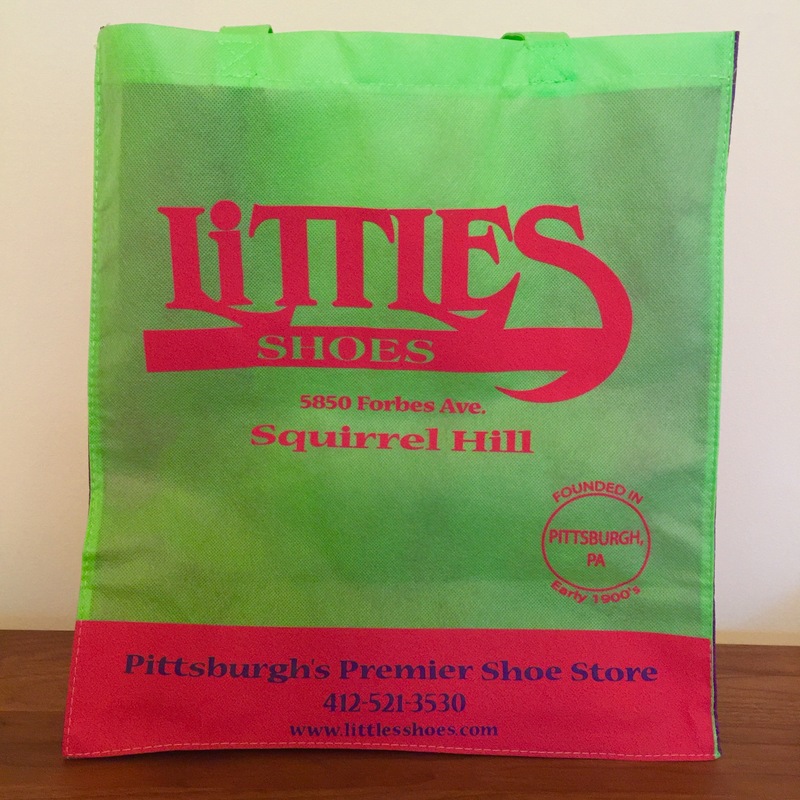 If this Little’s, opened in the 1930s in Squirrel Hill, invokes its “parent” store to get a founding date in the early 1900s, then this Little’s, like the others, came out of Homestead. Does it really matter that this store has its roots in Homestead, not Pittsburgh? Even Jacob and Hymie, who never lived in Homestead, knew that to have been a merchant on the Avenue was once a big deal, and to have been a leading merchant, especially in as competitive an area as their family was in, was no small achievement. Not for nothing did Ben show off his roots in his 1930s advertisements after he relocated to Squirrel Hill. At that time everyone would have understand the reputation implied by that simple statement, “Originally from Homestead, Pa.” Together, H.L., Ben, Jacob, and Hymie exemplified the large group of Jewish merchants who proudly represented Homestead and of whom Homestead was proud. Whether their competitive business interests meant that they also exemplified a certain kind of bickering, grudge-holding Jewish family is another story! Update, 4/27/2016: To be clear, my sole intention in writing this article was to praise the store by demonstrating that it has a much richer and more impressive history than what was passed down to the current management. I do not believe the store is intentionally obscuring its origins. This whole web site is about overcoming the limitations of memory and repairing the breaks in the transmission of our collective history. I am sure that this kind of break is what happened here. I truly regret if my words were taken otherwise. When I was growing up, we bought all our shoes in Homestead from Mr Saul Post. I really enjoy reading the articles on your site as I grew up in Homestead during the 1940s and 1950s. On the page you have from the Homestead 1908 directory there is a listing for Abraham Kartub. When I was a child our beloved family doctor was his son Jacob who had his office in Dravosburg Pa. There were no appointments then . You simply went to his office and sat in the waiting room and seen in the order of your arrival. Dr. Kartub also made house calls and I remember when I was seven years old afflicted with the mumps a visit from Doctor Kartub at our home. As a young boy I was impressed with his 1949 black Buick Special. I didn’t realize you were a Pittsburgher! Give me a yell the next time you come into town! So did we. BTW, it’s Sol Post. 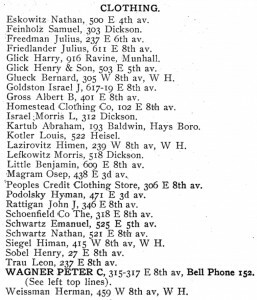 I was thrilled to see my grandfather, Julius Freedman listed as a seller of clothing. He moved to Homestead after his first wife died in 1901, remarried Annie, had a son, Oscar & died in Homestead in 1921, His 2nd wife having predeceased him. I have very little information on him from his life in Homestead. Would love to know more! This is fascinating, as is this whole site! I see a number of names that include members of my own family amongst the articles. I never knew a thing about the history of Little’s, although I shop there regularly as an adult now, and have certainly known it since childhood. I worked at Victor Shoe Store 1952-1957 while in High School/College. One of my co-workers was Richard Hepps. The store was owned at that time by Louis Little and managed by Louis Papp, two of the finest people I have ever known.